Finally, I made it over to Pauline's when they were actually open (their hours are strange--closed Mondays and not open til 12 on some days). Unfortunately, even when I arrived at 12.30 it looked like the cases hadn't yet been filled--kind of a bummer in such a small place (I like a well-stocked bakery case--part of the fun is looking before you buy, no?). 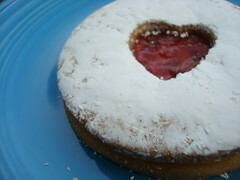 However, the cookies that they did have out looked tempting, so I chose a Linzer tart. It was an adorable fruit-filled cookie sandwich with a sweet heart cutout, and a dusting of powdered sugar on top. The cookie was buttery and sweet--subtle, but very good. If I had to make one change, I might have put slightly less powdered sugar on top, but this is likely because I'm a messy eater. The jam in the middle was the perfect complement to the rich, buttery cookie. And at $1.25, it was a steal! I've been told that the cupcakes, scones and tarts are also worth a try--based on what I've tasted, I am definitely interested enough for a return trip! Pauline's, 2315 NW Market St., Ballard; (206) 588-8098.